Guidelines on travel in Kelantan, Malaysia. Visit Kelantan Year 2008. Located approximately 55 km from Kuaia Terengganu, the Kenyir Lake is reputed to be one of the largest and most fascinating man-made lake in the world. Covering an area of 369 sq km, it is also Malaysia’s largest rock-filled hydroelectric dam. When the area was inundated by water, most of the hills were above the water level, thus creating about 340 man-made islands. Surrounded by a lush tropical jungle, the Kenyir Lake is a popular and ideal retreat for nature lovers, anglers, photo enthusiasts and fun seekers. Some of the activities which could be carried out here are fishing, swimming, canoeing, boating and jungle trekking. Due to the cleanliness of the lake and abundance of food supply, the Kenyir Lake has a wide variety of fresh water fish such as Baung, Toman, Kelisa and Lampam. Accommodation such as houseboats, floating chalets and lakeside resorts are also available to visitors. The staging point for visits to the Park is Kuala Tembeling from which a 3-hour boat ride upriver takes you to Kuala Tahan, the park headquarters. Boats depart from Kuala Tahan at 9.00 a.m. and 3.00 p.m. daily, except for Fridays when the afternoon departure is at 2.30 p.m. Taman Negara Resort also operates a speedboat service that take only 45 minutes to reach Kuala Tahan. The speedboat leaves Kuala Tembeling at 10.30 a.m. and 1.30 p.m. daily. From Kuala Lumpur, a 3-hour drive takes you to Jerantut. Then proceed 16 km north to Kuala Tembeling.Jerantut bound taxis may be found at the Pudu Raya Bus Terminal in Kuala Lumpur.Alternatively, take a bus from the Jalan Tun Razak Bus Station in Kuala Lumpur for Jerantut and from there, take a local bus or taxi to Kuala Tembeling. Kuala Tembeling is also accessible from Kuala Lumpur, Singapore or Kota Bharu (via Tumpat) by rail. Trains from these stations stop at Tembeling Halt, about half an hour’s drive to the jetty at Kuala Tembeling. Taman Negara holds an endless list of exhilarating sights and exciting activities for you. Let your spirit of adventure take you on an unforgettable tour of nature. After all, it did wait 130 million years for you. Spend a night in one of these and try to spot a bear or any of the park’s other animals as they quench their thirst at the salt licks located a mere few feet away. One such settlement is Kampung Yong where you can get a better insight into one of Malaysia’s aboriginal people, the Batek. With over 350 species of birds which include Drongos, Malkohas, and the Pied Hornbills, the park is naturally one of the premier bird-watching sports in the region. Encounter spectacular rock formations and a great variety of life within the mystifying interiors of the numerous caves here. Gua Telinga, Gua Kepayang and Gua Daun Menari are among the more popular caves. A must for thrillseekers. Travel upstream from Kuala Tahan on Sungai Tembeling and experience 45 minutes of sheer thrill as you and your boatmates negotiate seven sets of rapids. Nothing beats a closer loom at the 10,000 or more species of flora that can be found in this jungle paradise. The trail leading up Peninsular Malaysia’s highest peak is 55 km. from the Taman Negara Resort. The climb is strenuous and demands sound physical and mental fitness. Located just 1.7 km. from the resort, it takes you only about 45 minutes to reach the hilltop. A great picnic and swimming location surrounded by an inspiring natural landscape. Installed about 30 metres high and stretching over 400 metres, this is the world’s longest canopy walkway, From here, you get a closer look at life at the top of the world’s oldest tropical rainforest. Make a trip to the upper reaches of the Tahan or Kenyam rivers. What a challenge it’ll prove tackling a 20 pound Kelah, a fish that will thrill even the most sessoned fisherman. The ecotourist will find much to delight him were he to take an upriver cruise of Sungai Kelantan into the virgin rainforests of Kelantan. The secrets of the jungle will unfold itself if he looks and listens; and the little villages along the bank is an added bonus. Take Bus No. 5 which leaves the main terminal at 7.45 every morning for Kuala Krai. At Kuala Krai, take the boat which leaves at 10.00 am for Dabong. The 2-hour boat ride affords ample time to take in the grandeur of the rainforests. Upon reaching Dabong, you have about three hours to while away before catching the boat back to Kuala Krai at 3.15 pm. Take a stroll around the village and observe the villagers at their daily chores. Alternatively, you can venture up to Jelawang to stay the night in one of the chalets (RM25.00 including meals). A one and a half-hour jungle trek brings you to the Jelawang Waterfall, spectacular and every bit worth the effort. If you decide to return to Kuala Krai on the same day, you can catch a taxi from Kuala Krai to Kota Bharu. Please note that there are no boats available on Fridays. The southbound train from Dabong brings you to Gua Musang in two and a half hours. Here is where the majestic Lata Beringin is located. Gua Musang also lies within the National Park ami st the splendour of the world’s oldest rainforests. Explore the many limestone caves, cascading waterfalls or enjoy a river boat safari. There are similar trips organised by the Tourist Information Centre in Kota Bharu. You are advised to book in advance. The jewel in the crown is undoubtedly Lata Beringin. At 120m, it is also one of the highest waterfalls in the country. The pool at the base provides a rejuvenating dip The magnificent view and lush surroundings make this a popular camping spot. Lata Beringin is near the Sungai Pas Kesedar Land Scheme. It is accessible via a dirt track leading off from the Kuala Krai-Gua Musang highway. Jeram Lenang is another favourite among the locals. The waterfall is only 12 metres high but nonetheless, draws the crowds. Bus No. 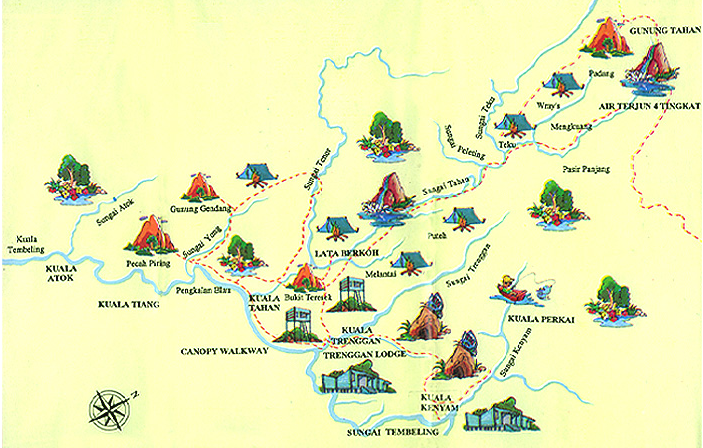 3 will take you to Pasir Puteh, from where you can board a taxi to Jeram Lenang. You are currently browsing the archives for the Lakes Rivers and Waterfalls category.